Facial palsy can be managed through treatment regime depending on different causes. Home remedies also help hasten the pace of recovery. Get details! Facial palsy refers to transient and reversible weakness of the facial muscles due to injury or damage to facial nerve fibers. Human face is supplied with an extensive network of nerves and sensory endings that are responsible for carrying electrical signals and impulses from and to the brain. These signals are required for optimal muscle movement and coordination of different facial tissues to produce the desired response. However in certain temporary or permanent neurological conditions, the signal conduction to these nerves is significantly compromised, leading to muscle weakness or paralysis. Facial palsy can be subdivided into partial (lower face only) or complete facial paralysis (upper and lower part of the face). 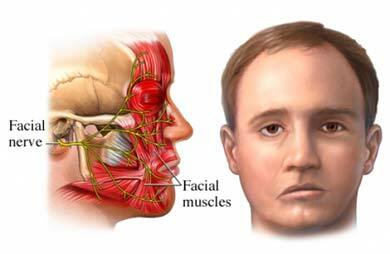 Facial palsy can produce disturbance in the normal activity of muscles that control the movement and activities of eyes, mouth and other facial structures. The exact etiology of Bell’s palsy is not known. In most cases, the individual loses the control of facial muscles on one side of the face. The onset is usually sudden and is often a result of inflammation or viral attack of the herpes virus (also referred to as the cold sores).Clinically, several metabolic or neurological conditions can present as Bell's palsy. Bacterial infections such as middle ear infection and Lyme disease can often present with transient weakness of facial muscles. Neurological diseases such as Guillian Barre disease and neurofibromatosis. Childbirth trauma during the process of labor can also lead to nerve damage and loss of electrical conductivity that may present as motor deficits and weakness of facial muscles. Babies born via instrumental delivery are at much higher risk. Congenital defects resulting in abnormal development of facial nerves and/ or muscles. Cerebral hemorrhage or stroke can also lead to facial nerve palsy and weakness of facial muscles; however, it is imperative to mention that paralysis in this case is due to brain involvement. In other words, facial nerve is normal and the symptoms are produced due to inability of brain to respond to the sensory information received from the face. Genetic diseases such as Moebius syndrome and CHARGE syndrome are some other notable but rare causes of facial palsy. Any surgical intervention of neck and face region can also lead to facial palsy due to irritation or damage to facial nerve fibers. The risk is highest in the surgeries of facial tumors and parotid gland. Facial palsy can be due to a serious underlying organic condition such as stroke. It is therefore recommended to seek emergent medical help to address the issues and minimize the risk of complications. If the onset is serious or you are experiencing other symptoms as well such as altered level of consciousness and headache; call 911 or an ambulance for emergency evaluation. Since facial palsy is caused by Bell’s palsy in most cases, here are some treatment strategies and home remedies to help the condition. In most cases, Bell’s palsy recovers within two months, especially if some level of facial movement is possible. However, in other cases, where no signs of recovery are seen after a week or so, corticosteroids can be used to reduce the inflammatory response to aggravate the chances of early recovery. In case of facial palsy caused by viral infections, antivirals such as ganciclovir can be used to treat the microbe itself, although that being said, there is little scientific evidence that antivirals can have a profound effect on facial palsy. Besides allopathic treatment, there are many ways to help treat facial palsy at home. These methods may also acts in synergy with an ongoing medical treatment. Supportive Care: Some individuals also lose their ability to blink, which can cause dryness. If this condition persists, serious damage to visual senses can result. For such cases, artificial tears, which keep the eyes lubricated are best recommended, they do not need to prescribe necessarily. Use moist fingers to close and open your eyelids many times a day and use sun protectant glasses when stepping in the sun. Flossing: Regular flossing is also an important tip for people suffering from facial palsy, since loss of sensations can result in an inability to feel small pieces of food in the corners of mouth. If they are not removed through regular flossing, they will cause dental caries and may lead to other dental hygiene issues. Treatment for facial palsy caused by reasons other than Bell’s palsy may involve surgical intervention to narrow down the eye opening temporarily or on permanent or temporary basis. The doctor may also recommend the use of an eye patch to prevent drying of the iris. Facial palsy can be managed via anti-inflammatory and antivirals agents. Always follow your doctor's treatment plan. What Are Flexeril and How to Use It?